Q: Are there any specific problems with building codes? 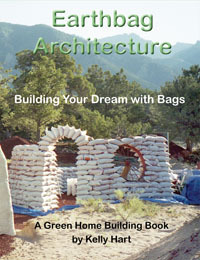 A: The main problem with building codes is that earthbag building is so new, the technique is not generally recognized officially, so it may take longer to convince the authorities that the method is viable and safe. Q: I'm getting some mixed signals. On one page of your website you state "Building with earthbags, as I have done, is completely out of the question." I gathered after reading this that you had already determined that an EB home could not be built legally. A: Well that was a decade ago, when earthbag building was virtually unheard of. The Uniform Building Code would not have known how to handle that strange house, I'm sure. Since then there have been a number of earthbags homes built with permits, so authorities might be more open to it. At least there are these precedents. As an example of how far things have moved toward sustainability, you might read about the new National Green Building Standards just adopted by the ICC, the same folks who authored the Uniform Building Code: greenhomebuilding.com. This doesn't mean that they would necessarily accept alternative building techniques, since the codes lag behind, but they should be more amenable to them. Q: All sounds fabulous....large question of where such building is "up to code" and for which permits can be obtained remains for me. A: As you say, the issue of code compliance is a major one. There have been successes with this...see projects/hawaii and Testing/superadobe . Of course these are just two jurisdictions, so other localities would need to be be approached to see how open they are to this sort of thing. It usually helps to have an architect or engineer vouch for the safety of alternative buildings. Q: Do you have to be a licensed builder or architect to build your own home? A: This really depends on the laws where you want to build. In most places owner/builders can build their own homes, as long as they comply with all of the building code requirements. Q: What do building codes say about this kind of building technique/material? A: It depends on how liberal the local building officials are. Earthbag building is fairly new and therefore less known than other alternative building methods, so it may be more difficult to get through the red tape. Nader Khalili at Cal-Earth has been working for many years to have his techniques of "superadobe" (using earthbags filled with adobe) be adopted by the Uniform Building Code. He has convinced his local building dept., in Hesperia, CA, to allow this sort of building. I built my earthbag/papercrete house in a county of Colorado that has not yet adopted building codes, so that was fortunately not issue for me. Q: Our state will allow building with earthbags as long as we have an engineer's or architect's stamp of approval. The architects that we used for our strawbale barn plans are probably not quite advanced enough for this. Do you know anyone who might fit the bill? A: You might enquire at Cal-Earth in Hesperia, CA. They might have some general engineering data about earthbag construction, since they have been trying to get ICBO code approval for several years. email: CalEarthATaolDOTcom; phone: 619-244-0614. Q: What kind of inspectors and licenses do you need for this kind of structure? A: Again this is a matter of local jurisdiction. Some places will allow "experimental" building (New Mexico, for instance), but you need to have a licensed engineer sign off on the plans and show that they comply with the requirements of the codes there. Q: What about insurance? Will most insurance companies cover this kind of structure? A: We got insurance on our place, but the insurer never looked at the house, or even asked if there was anything unusual about it. Q: I have decided that earthbag/superadobe is for me. My vision is a southwest style adobe home. I have found a retired building inspector who will draw my plans for a building permit. I need information about the roof. A: As for a roof, these are typically going to be rather standard rafter or truss systems. The only difference with earthbags is that you will probably want to have a concrete bond beam on the top of the bags. J-bolts can be imbedded in this to attach the sill and the rest of the roof to...and this should pass the code. See what your inspector friend says. Q: I am building a 40' diameter half-circle house into the earth, about 7-8' high at the highest. I would like to use earth bags or some alternative to concrete. Aside from barbed wire on each course, what would I need to do to get this approved. I live in Northern CA (Mendocino County) and the house will be UBC (code). Is there anyone with experience building such a structure in earthquake country? A: The best example of code approval in seismic areas of California is the work done at CalEarth, near Hesperia. They have actually designed and helped construct an earthbag public building for the city, and the system was required to undergo extensive testing to be sanctioned by the authorities. Since then they have sold similar designs for complex dome structures that have been code approved in various other states. Every project is different, and every jurisdiction is different, and earthbag building is very new, so there are no guaranteed ways to assure success for getting building permits...but at least there are some precedents. Probably the best advise is to have a discussion with your building authorities and find out what they require in order to approve your project, then go about assembling what you can. There are some resources provided at this site of former testing that has been done as well as profiles of various successful code-approved projects. Q: My husband and I are interested in purchasing a lot in lower market rate neighborhood in the Bay Area and hopefully build an earthbag home that meets code/zoning requirements. Is this possible or wishful thinking? I am aware that the city of Hesperia Ca, allows for this type of housing. A: I think that eventually cities will be allowing earthbag building, as well as other more ecological techniques, because the need for green, sustainable architecture is becoming abundantly apparent. It might just take some time for this to happen. My best advice would be for you to approach the building authorities where you want to live and talk to them about your ideas, showing them examples of other successful code-approved earthbag buildings. You can become part of the process of legitimizing this truly ecological way of building. Q: I am inquiring about building an earthbag home. Has there been any new info regarding the legality and building codes for earthbag buildings? I know it varies from region to region. But it looks to me like it's isn't approved of anywhere. Have there been any changes recently? I desperately want to build one, but don't know of anywhere I can. A: I know of code approved earthbag houses that have been built in Hawaii, California, Utah, Arizona, and Kentucky. Of course it is up to the local jurisdiction whether they will allow this. Little by little, the technique is becoming more understood and accepted. Q: I am looking to purchase plans from you to present to my local building permit dept in White County Georgia. Earthbag building being completely unheard of by the building "authorities", they said they would need a set of plans stamped /signed by an engineer. Do the plans presented for sale on this site come with that? I want to build my home from pre-packaged bags of rice hulls. A: My suggestion for making the whole process flow smoothly in terms of permitting, would be to choose a design that can be built with a rigid post and beam framework, and use the rice hull bags as wall infill. This is often done with strawbales, and it gets around any issues about the walls needing to bear any weight. Engineers needs proven test data for weight-bearing structures, and this data is likely not available for rice hull bags. Q: We don't know if Chatsworth, Ontario is open to earthbag building, or whether a permit for it will be possible. What documentation/research/information could you recommend to present to the township? A: I don't know if you found my other website, www.earthbagbuilding.com, but I recommend studying this rather closely for ideas for your own construction and for material that could support an application to your building authorities. Earthbag construction is relatively new so that there hasn't been as much testing and code acceptance as with more common building methods...but that doesn't mean you can't do it. Q: I'm old, crippled and the doctors say 90% clogged heart BUT before I die I WILL BUILD AN EARTHBAG HOME. I just need to convince local inspectors of its structural integrity...any suggestions? A: The best way to deal with your building authorities is to talk to them head on, armed with lots of information about earthbag building and examples how successful it has been. You need to find out exactly what they need in order to approve your project, and go about fulfilling those requirements. It might mean that you need to have an architect or engineer involved to stamp the plan; this varies from one location to another. Q: We are trying to permit an earthbag house in San Diego County and are looking around for some help to convince the building department to allow earthbag construction. We have a schematic home design ready but need some supporting evidence for the construction before we meet with the county engineers. A: I suspect that you are going to need to have an engineer sign off on the plans. One firm that has experience with this is Nabil Taha of http://www.structure1.com/, and they are licensed in most states. He would at least be able to give you some advice about how to proceed. He provided us with some generic schematics that might give you an idea of his approach. Since there are no established standards for earthbag building, it is hard to point to specifically acceptable models. You might browse www.earthbagbuilding.com and see if anything stands out as supporting evidence, and you are certainly welcome to print it out and take with you to your meeting. Q: I have a dream of starting a community center/afterschool program. I want to make sure that I could even get local authorities to "permit" such a building, so maybe I should start there before I do a lot of research on the "how to" part. My husband and I are also interested in building an earthbag home. I am sure we would also need to get permission from local authorities but this may be easier to do for a home? It sounds like they are wonderfully sound and safe (better than most other structures) but that the majority of building codes just need to be updated to include them? A: I think that you are right that the first step would be for you to have some preliminary discussion with your local building authorities about what they will allow, and what their requirements are. I suggest that you take with you some pictures of some buildings similar to what you imagine you might want, and perhaps some material that describes the earthbag technique so they have an idea of what you are talking about. There are usually ways around specific codes, and sometimes this involves getting a state-licensed architect or engineer to sign off on the plans. This of course adds cost to the project, but it is possible. Q: We are building in north Florida. Do you by chance have the material certification needed for the different materials used, i.e. : bags, dirt, etc? The engineer who is going to adapt your plans for Florida code, said that I will be responsible for materials list, and building inspector said we must provide list. We can get the window, door and roof material certification from those manufacturers, but not sure how to certify the bags and the dirt. A: (Owen Geiger) Building materials go through an expensive ASTM testing and certification process that can cost hundreds of thousands of dollars. Manufacturers have to do this in order to meet code and sell their products. This has never been done with poly bags because most bags are used for packaging rice, etc. The best you can do is contact the manufacturer and get their material specifications for shear strength, weave, UV rating, etc. -- whatever they can provide and hope this satisfies the inspectors. Because the bags are not tested specifically for building houses, it will be up to the discretion of the building inspectors whether or not to accept them. One thing that may work in your favor: the bags have probably been ASTM tested for packaging. If you can get the ASTM number and data then maybe the inspectors won't notice or care. They mostly want the info for their records. Soil: contact a local engineering company who does soil tests. This is common and straightforward. You might need two sets of tests. One for the soil conditions under the walls, another for the earthbag fill material. Q: In Washington state it is a bit difficult to have a permit for this type of construction. However I found a place they may issue a permit if the plan agrees with the energy code of Washington. I am not an architect, not sure if will or not. A: If it is the energy code that needs to be addressed, there are various ways to provide increased insulation with earthbags, either through filling the bags with insulating materials (like volcanic stone, rice hulls or perlite) or by lining the exterior earthen filled bags with insulation.